Mumbai, September 10, 2018: The NSE Academy Limited, a wholly owned subsidiary of National Stock Exchange of India Limited (NSE), [email protected] ([email protected]), the online journal of research and business analysis of the Wharton School of the University of Pennsylvania and Wharton Executive Education (WEE) have signed a Memorandum of Understanding (MoU) to impart financial knowledge and skills to Indian high school students across the country. The 9th and 10th grade students in Tier II and III cities would get a great opportunity to have access to the courses from one of the world’s most renowned business school, Wharton School. Wharton’s specialized global courses will be offered to students in smaller towns through state of art technology. The think-tank at the NSE and Wharton are in the process of designing developmental and customized content for the course based on materials developed by [email protected] High School and Wharton Executive Education. This course will be delivered through a digital platform and will enable students to understand intricacies of finance. 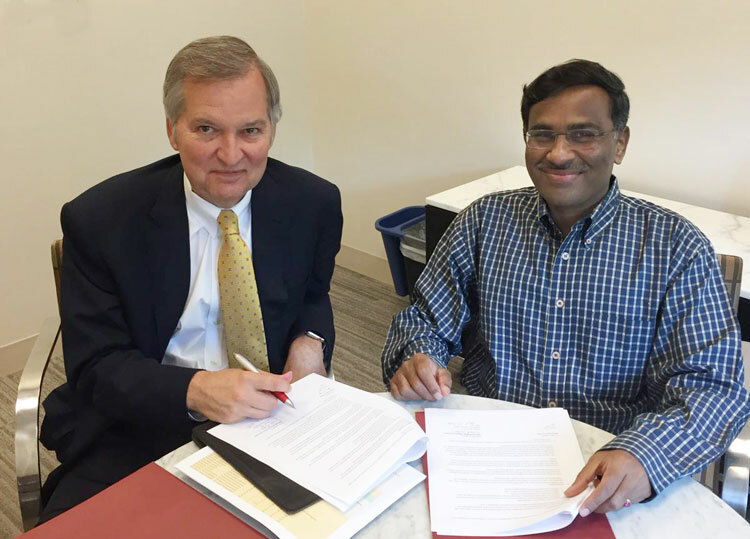 Mr. Vikram Limaye, MD & CEO, NSE and Dr. Michael R. Gibbons, Deputy Dean, Wharton School, University of Pennsylvania, signed the MoU at The Wharton School of the University of Pennsylvania, Philadelphia. NSE Academy, Wharton Executive Education and [email protected] will collaborate to educate high school students in India about finance and investment. They will also work together to further expand the [email protected] High School (KWHS) Investment Competition, which has been offered to high school students in India and other countries in recent years. In addition, they will jointly offer an online course for high school students in India. The course will be developed and distributed by NSE Academy, Wharton Executive Education and [email protected]/KWHS. NSE Academy will collaborate with [email protected] ([email protected]) and Wharton Executive Education to launch and expand the reach of the [email protected] High School Investment Competition in India by taking the competition to tier 2 and 3 cities. NSE Academy Limited is a wholly owned subsidiary of National Stock Exchange of India Limited (NSE). NSE Academy promotes financial literacy as a necessary life skill. NSE Academy’s initiatives, including partnerships with state and national school boards and schools, interactive courses on personal finance and certification programs, teach school children, homemakers and other non-finance professionals the value of investing, provide an introduction to the Indian capital markets and help to develop new market professionals. Wharton Executive Education delivers best in class, integrated learning experiences to advance leaders at every level. Designed and taught by Wharton School faculty of unparalleled depth and breadth, our programs are rooted in the latest research, enhance business acumen, and encourage new ways of thinking to solve the business and leadership challenges of today and tomorrow. [email protected] ([email protected]) is the online research and business analysis journal of the Wharton School of the University of Pennsylvania. Launched in 1999, [email protected] is published in English, Spanish, Portuguese and Chinese and has evolved into a network that reaches some 3 million users worldwide. [email protected] High School (KWHS), part of the [email protected] network, is an online portal for high school students and educators. In addition to publishing articles and lesson plans related to business, finance, leadership and entrepreneurship, KWHS helps nurture financial literacy and 21st century skills through initiatives like the global KWHS Investment Competition. The National Stock Exchange of India Ltd. (NSE) is the leading stock exchange in India and the third largest in the world by nos. of trades in equity shares in 2017, according to World Federation of Exchanges (WFE) report. NSE was the first exchange in India to implement electronic or screen-based trading. It began operations in 1994 and is ranked as the largest stock exchange in India in terms of total and average daily turnover for equity shares every year since 1995, based on SEBI data. NSE has a fully-integrated business model comprising exchange listings, trading services, clearing and settlement services, indices, market data feeds, technology solutions and financial education offerings. NSE also oversees compliance by trading and clearing members with the rules and regulations of the exchange. NSE is a pioneer in technology and ensures the reliability and performance of its systems through a culture of innovation and investment in technology. NSE believes that the scale and breadth of its products and services, sustained leadership positions across multiple asset classes in India and globally enable it to be highly reactive to market demands and changes and deliver innovation in both trading and non-trading businesses to provide high-quality data and services to market participants and clients. Disclaimer: National Stock Exchange of India Limited is proposing, subject to receipt of requisite approvals, market conditions and other considerations, an initial public offer of its equity shares and has filed a draft red herring prospectus dated December 28, 2016 (“DRHP”) with Securities and Exchange Board of India (“SEBI”). The DRHP is available on the website of SEBI as well as on website of the Managers, Citigroup Global Markets India Private Limited at http://www.online.citibank.co.in/rhtm/citigroupglobalscreen1.htm, JM Financial Institutional Securities Limited at www.jmfl.com, Kotak Mahindra Capital Company Limited at http://www.investmentbank.kotak.com, Morgan Stanley India Company Private Limited athttp://www.morganstanley.com/about-us/global-offices/india/, HDFC Bank Limited at www.hdfcbank.com, ICICI Securities Limited at www.icicisecurities.com, IDFC Bank Limited at www.idfcbank.com and IIFL Holdings Limited at www.iiflcap.com. Potential investors should note that investment in equity shares involves a high degree of risk and for details relating to such risk, see “Risk Factors” beginning on page 19 of the DRHP. Potential investors should not rely on the DRHP filed with SEBI for making any investment decision.